As designers we are often working on a wide variety of creative projects and briefs, so it makes total sense that we should have a diverse arsenal of resources that we can rely upon. Today’s bundle brings you an incredibly varied, endlessly versatile collection of professional grade vectors that will ensure you are well equipped for any project that comes your way. Time is money for a designer, and arming yourself with the right library of tools ensures you can hit the ground running on any creative project. 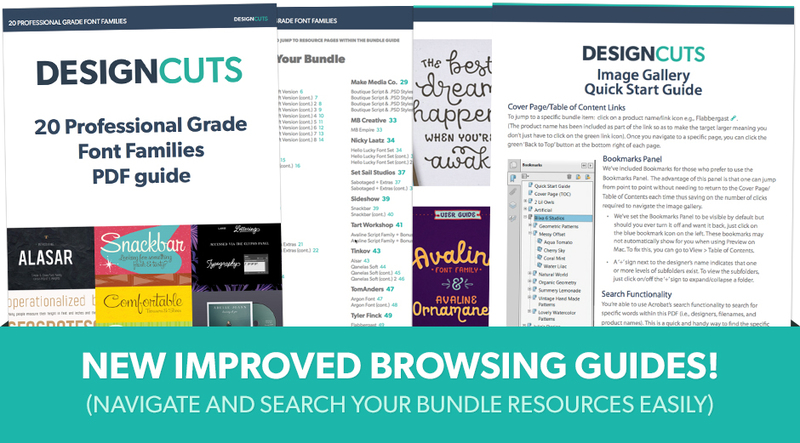 Today’s bundle is our most varied to date, and includes literally thousands of professional quality items. Discover incredible brushes, graphics, icons, illustrations, logo generators and so much more! Whether your next project is a vintage extravaganza or a super modern corporate brief, this bundle has you covered! You can find literally every aesthetic and variety of item you’ll need, so you always have the perfect resource available to hand. These items are selling like hot-cakes at full price, as they’re so incredibly useful. The work that has gone into each set is staggering. You’re getting access to work from top illustrators, expert brush creators, and experienced icon designers. The rare vintage illustrations have been carefully scanned, extracted and cleaned up for your easy usage. The hand-painted elements have been beautifully crafted and digitalised. The icons have been made pixel perfect and sharp at every size and resolution. This bundle brings you thousands of hours of work from top names in the creative field, all available for a whopping 99% off. Introducing the one-of-a-kind, Greeting Card and Catchword Kit, a totally unique, hand-illustrated treasure trove of ready-to-use catchwords, expressions, sentiments, greetings and more! • .OTF & .TTF Font Files now included! Want this kit in a handy font file? Well, I’ve got you covered! Now you can install font files, and browse the catchwords and sentiments in your glyphs panel. (Both .OTF & .TTF files are included). • These files can be opened in Illustrator CS or newer and with similar vector-editing programs (like Inkscape). • The words and illustrations can be used to create Greeting Cards, Party Invitations, Birth Announcements, Save the Date Cards, Wedding Invites, Get Well Soon Cards, Merchandise, Typography Projects, Stamps, Gift Tags and so much more! I’ve even included words like: “Home, Contact, Portfolio, FAQ and Newsletter,” so that you can use these as static images on your website. Woo hoo! • Yes, but this is a vector-specific kit, so you’ll have to rasterize the files and then use your lasso tool to grab the one you want. Then just copy and paste into your project. Software compatibility:Adobe Illustrator CS1 and newer. .EPS files will work with a variety of programs such as Adobe Photoshop or Illustrator, Sketch, InkScape, Affinity, Corel Draw, etc. 2:00 AM on a Sunday night. I’m working on the latest brush pack for you guys and an old song from high school pops on (It’s a Shame About Ray by The Lemonheads). I started thinking about my high school stuff. My first beater car, doodling in notebooks, going on weekend adventures with my friends Gabe and Melissa. In that spirit, I decided to make a brush pack as a tribute to high school nostalgia. • Adding textured shading to your illustration work. • Filling areas with color (like the stripe on the car – I used one of the gray art brushes for it and set it to – Multiply in Blending Modes). • Add distressed textures around the edges of stuff (set the brush to the same color as the background and use conservatively on edges). • 20 brushes including halftone interference patterns, hand made cross hatchers, watercolors, doodle fillers, and ink brushes. • Instructions for installing, using, and tweaking your brushes. • Our famous RetroSupply Quick Reference Sheet that shows you all the brushes, includes tips for using them, and the story behind the pack. • Compatible with Adobe Illustrator CC and CS6. Grab the pack today and start bringing fresh strokes and textures to your illustration work! Software compatibility: Adobe Illustrator CS6 and newer. Create perfect pencil illustrations quickly, easily and digitally! This exciting pack is the result of all your requests for a brush pack that doesn’t stretch when strokes are elongated. With this set you can use just one brush to create a range of stroke lengths without having to switch brushes – making drawing quicker and much more like the real thing. How does the brush set work? I’ve used the pattern brush feature to build brushes that repeat the same section seamlessly along the stroke. Each brush contains end tiles alongside both inner and outer corner tiles for drawing right angles. (Beware of pattern art brushes not including corner tiles as the ability to draw fluidly is seriously inhibited without them). Taking on board customer feedback, but not losing the life-like fluidity of a pencil was the real challenge. The danger when using pattern brushes for artist tools is that they lose the vitality of the source material, but I’ve definitely achieved my goal with this pack. I’ve also included some dynamic and very short brushes too so you have a brush for every purpose. Graphite Pencil Brushes: 12 Anti-stretch brushes and 12 short brushes – based on real pencil lead grades. • Coloring Pencil Brushes: 6 Anti-stretch brushes, 2 short brushes and 4 dynamic strokes. All sourced from genuine pencils. Using colors taken from real graphite. Use these to color your artwork accurately and quickly. A great new collection of fresh mouse made geometric logos! We try to offer only high-quality items that will be useful and easy to use for your projects. The logo templates in this pack are 100% editable and scalable. You can open and edit with both Photoshop and Illustrator and with 100 vector elements included you can start mixing and create a lot more templates for your own projects! • Easy to modify, edit, re-size and color without the loss of quality or resolution. 100% vector shapes editable in Photoshop and Illustrator. • Editable text. All fonts used are free or free for personal use only. The links for the fonts are in the .PDF file included. Software compatibility: Adobe Photoshop and Illustrator CS1 and newer. .EPS files will work with a variety of programs such as Adobe Photoshop or Illustrator, Sketch, InkScape, Affinity, Corel Draw, etc. Based on our community’s great feedback, we spent the last 6 months expanding and fine-tuning every icon to look perfect at various standard sizes, from 24px to 96px. We strongly believe this icon pack gathers the most useful icons for your UI and web projects. • Each icon was meticulously crafted to align perfectly on 4 different pixel grids: 24px, 32px, 48px, 60px. No more fuzzy icons at small sizes! • All files and folders are neatly organized. Each icon is properly named. Software compatibility: Adobe Photoshop and Illustrator CS1 and newer. .JPG, .PNG and .SVG files will work with most graphic software. .EPS files will work with a variety of programs such as Adobe Photoshop or Illustrator, Sketch, InkScape, Affinity, Corel Draw, etc. The ultimate collection of ink illustration designs. All elements are vector and easily editable through Adobe Illustrator or Photoshop. • Hand-Drawn Mountain Scenes: 9 nature design elements with a unique ink illustration style. • Geometric Landscapes: 6 nature design elements with a unique ink illustration style. • Vintage Nautical: 3 hand-drawn designs. • Wild Nature: 28 outdoorsy, hand-drawn elements. • Carpentry Tools: 6 hand-drawn designs. • Anvil: 1 hand-drawn design. • Floating Mountain: 1 hand-drawn design. • Note: some mockups are not included but can be downloaded for free (links provided in text files). Software compatibility: Adobe Photoshop and Illustrator CS3 and newer. .PNG files will work with most graphic software..EPS files will work with a variety of programs such as Adobe Photoshop or Illustrator, Sketch, InkScape, Affinity, Corel Draw, etc. Watercolor Wonders, that was the first thought in our mind when our colleague, watercolor artist Daria Vinokurova showed us these beautiful illustrations. We love all our artistic products, but this one is really something! Meet the set of 50 gorgeous watercolor illustrations available in vector .EPS format and .PNG with transparent backgrounds. Flowers, leaves, branches, corals, berries and seamless patterns — all these assets can become an ultimate artistic tool and bring your work to the next level. Whatever project you are working on right now: wedding invitations, apparel design, greeting cards, packaging, stationery, logo design, merchandise, posters, websites, digital presentations — Watercolor Wonders would be a great addition to your visual. • 6 unique patterns 600×600 (.PNG, .JPG, .EPS). Software compatibility: .JPG and .PNG files will work with most graphic software. .EPS files will work with a variety of programs such as Adobe Photoshop or Illustrator, Sketch, InkScape, Affinity, Corel Draw, etc. Each element happy or sad, angry or funny, surprised or disappointed has been made for your design fun! Choose emotions for any item. These tools will help you create your own logos and branding. You have a cafe with burgers or sushi? Maybe you need to create a corporate identity for a cleaning company? Or you have a vegetable shop or you want to decorate your blog with icons? Use patterns that are ready to use for your branding or different elements. Create your designs using 390 different tools. All items are stored in two styles: Color and Line. Select any you like. Software compatibility: Adobe Illustrator CS3 and newer. .PNG files will work with most graphic software. .EPS files will work with a variety of programs such as Adobe Photoshop or Illustrator, Sketch, InkScape, Affinity, Corel Draw, etc. Set of 16 watercolor tropical leaf illustrations. Illustrations are drawn by hand and vectorized. You can use it for making design projects, cards, patterns, greeting cards, posters, website and other projects. File formats: .AI, .EPS, .PNG and .JPG. Software compatibility: Adobe Illustrator 10 and newer. .JPG and .PNG files will work with most graphic software. .EPS files will work with a variety of programs such as Adobe Photoshop or Illustrator, Sketch, InkScape, Affinity, Corel Draw, etc. Set of watercolor aquarium fishes. 8 fishes and 5 plants. You might recognize these little guys from the dentist’s office or your middle school trip to the aquarium. And thankfully, these glimmering beauties are hardier than the goldfish you won at the fair. 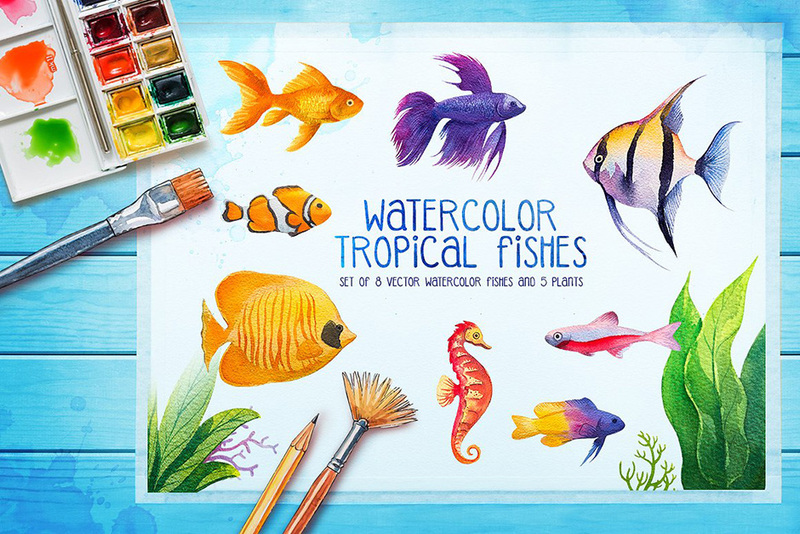 These watercolor fish illustrations are ideal for posters, pet store advertisements, tropical vacation websites, and of course waiting rooms at dental offices. Fish included: betta fish, neon tetra, angelfish, golden butterflyfish, clownfish, goldfish, gramma fish, and seahorse plus five tropical ocean plants. Set of over 29 watercolor Nautical illustrations. Very stylish, colorful and detailed illustrations. Illustrations are drawn by hand and vectorized. Perfect graphic for making design projects, cards, patterns, greeting cards, posters, website, DIY and other projects. • 29 .PNG, .JPG and .AI individual elements (transparent background). Software compatibility: Adobe Illustrator 10 and newer. .JPG and .PNG files will work with most graphic software. It’s not the Boston Symphony Orchestra, but this collection of instruments can satisfy quite a few troupes. A little jazz band, a local rock group. Maybe some mariachi. From the folk tunes of the pan flute to the wild solos of Van Halen’s electric guitar, there’s a couple millennia of song in this single watercolor ensemble. Grab the treble clef and strike up a tune. These musical instrument illustrations are ideal for tickets, posters, album art, concert programs, and interior design. Instruments included: tambourine, snare drum, bongo drum, electric guitar, acoustic guitar, pan flute, grand piano, saxophone, accordion, maracas, trumpet, and violin – plus treble clef, microphone, and headphones. 3 unique hand draw baroque elements. These three baroque ornaments will perfectly frame the family portrait of your great-grand uncle Henry. Formed of inlaid floral gold patterns and topped with crowns, these baroque elements are great for wedding invitations, logos, frames, and of course royal occasions. Rich gold shines against any background, whether light or dark. Illustrations included: heart-shaped floral gold pattern, triangular floral gold pattern with plaque for handwritten or vector text, and one more vintage background. Software compatibility: Adobe Illustrator 10 and newer. .PNG files will work with most graphic software. .EPS files will work with a variety of programs such as Adobe Photoshop or Illustrator, Sketch, InkScape, Affinity, Corel Draw, etc. Set of 5 Watercolor Galaxy backgrounds. Stare into the cosmos with five galaxy watercolors that feature the striking iridescence of the aurora borealis. Hand-placed celestial bodies – swimming in bold blues, pinks, and greens – create a contemplative mood. Each unique galaxy makes a great background for posters or cards; overlay with zodiac signs for a prophetic touch. Add planets for a suggestion of mystery and wonder. Also a solid choice for wrapping paper, t-shirts, iPhone cases, and shower curtains – even custom wallpaper for a bedroom or bathroom. File formats: .EPS and .JPG. Software compatibility: .JPG files will work with most graphic software. .EPS files will work with a variety of programs such as Adobe Photoshop or Illustrator, Sketch, InkScape, Affinity, Corel Draw, etc. There are so many different ways for you to use the holographic gradients. They are incredibly versatile for both print and digital projects. Gorgeous seashells collection; pearls, patterns, wreaths and more! Get your creativity going with this beautiful set of gorgeous seashells! They will work well as scene creators, ideal for wedding invitation designs, jewelry presentations, packaging, poster creations, branding… the possible uses go on and on! I also created a customizable glass with seashell decorations so you can have fun creating your own decor with seashells. You will find 3 premade designs to help you out when you are in a hurry! This collection will work great with Adobe Illustrator and Photoshop, as it contains vectors and raster images! What is in the Gorgeous Seashells collection? • 18 seamless patterns- 14 .JPG raster images in high res, sizes (1000 x 1000px and 2000 x 2000 px) and 4 .PNG raster patterns saved with transparent background so you can apply your own color! Software compatibility: Adobe Illustrator CS5 and newer. .JPG and .PNG files will work with most graphic software. .EPS files will work with a variety of programs such as Adobe Photoshop or Illustrator, Sketch, InkScape, Affinity, Corel Draw, etc. An amazing collection of vector and raster whale illustrations and decorative design elements! This beautiful collection will work great for Illustrator and Photoshop, graphics are provided in vector formats, high res .JPG images and .PNG images saved with transparent backgrounds. Have fun creating beautiful art with Orca whale, Blue whale, Humpback whale, Beluga whale, Sperm whale and Minke whale! They come in the form of scenic illustrations, swimming under the blue ocean surfaces, but also as part of abstract geometric symbols and add-ons. The print options are endless; great for card prints, posters, wall art, t-shirt designs etc..
Software compatibility: .PNG files will work with most graphic software. .EPS files will work with a variety of programs such as Adobe Photoshop or Illustrator, Sketch, InkScape, Affinity, Corel Draw, etc. There are 10 magnificent illustrations in this set, they all come as vectors and .JPG raster images. Use them as wall art, tapestries, posters, book/brochure covers, prints on pillows, greeting cards, website hero images… let your imagination go wild! Introducing the ultimate Gold Party pack! All that you need to create invitations, social media banners and promotional banners for all occasions: Wedding invites, Save the Date, Baby shower, Birthday greeting cards, New Year celebration, Garden Party invites, Valentine’s day greetings and so much more! Software compatibility: Adobe Illustrator CS and newer. Brushes work with Adobe Illustrator CC and newer. .EPS files will work with a variety of programs such as Adobe Photoshop or Illustrator, Sketch, InkScape, Affinity, Corel Draw, etc. .PNG files will work with most graphic software. This lovely botanical art collection features original illustrations of pretty peonies, graceful grasses, and dainty birds. Illustrated by hand in full colour, these drawings’ feminine florals and sweet colour palette are reminiscent of Victorian and Rococo period style. • .AI (CS6) – This product was created on Adobe Illustrator CS6. • .SVG – Converted from Adobe Illustrator CS6 format. Please note that artboards don’t work in .SVG format. However, the illustrations should work just the same. • .PNG – Transparent (no background) high-resolution images of the illustrations and the pattern. Software compatibility: Adobe Illustrator CS6 and newer. .PNG and .SVG files will work with most graphic software. This versatile collection of 80 clean circular vectors includes grids, charts, geometric shapes and graphic elements. Use them individually or combine them to create interesting graphic effects. Perfect for any type of project including illustrations, logos, graphics, presentations, animations, motion graphics, photo masks, t-shirts, art prints, crafts and merchandise. • 20 circular charts with editable stroke weights. • 20 circular grid effects. • 20 circular graphic elements. • 20 circular geometric shapes. • All vectors are supplied as individual Illustrator 8.0 .EPS files which are compatible with most vector and bitmap applications such as Adobe Illustrator and Photoshop. • 4 .PDF visual reference guides – 1 for each of the collections in the toolkit. A collection of 32 individual vector diagrams – all with a retro space theme. Space craft, shuttles, rockets, astronauts, space stations, telescopes, vehicles and lunar elements are all included in the collection. These are great for retro flyers, posters, illustrations or products. • 32 individual vector diagrams supplied as Illustrator 8.0 .EPS files which are compatible with most vector and bitmap applications such as Adobe Illustrator and Photoshop. • Includes a .PDF visual reference guide. Create your retro emblems in minutes! Need retro emblem design? Try Logo Maker by Vecster! Discover easy and fun ways of creating vintage emblems or badges in Adobe Illustrator! Works great for beginners and for professionals! 100% editable resources. Super simple instructions included. • Add-Ons folder with symbols, brushes, styles and swatches .AI libraries. • Vectors folder with layered .AI (CS+ and CS3+ ver.) and .EPS (CS+ and CS3+ ver.) files containing all design elements. • Rasters folder with hi-res (abt 5000×3500 px) .PNG files (raster design elements). • .TXT file with free fonts sources. 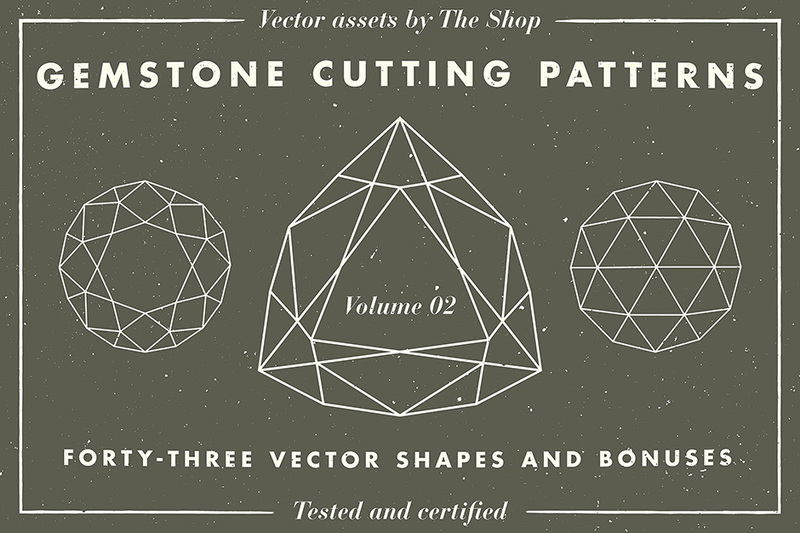 Introducing the gemstone cutting pattern vector elements, volume 02! Forty-three shapes (43) of gem goodness have been reproduced manually, line per line, from an illustration plate taken from a late 1800s book about gems cutting. They provide beautiful, and sometimes intricate, line work overlays for photos, but can also be center pieces in their own right. Another application would be hidden as a smaller icon within a bigger composition. Software compatibility: Adobe Illustrator CS and newer. .EPS files will work with a variety of programs such as Adobe Photoshop or Illustrator, Sketch, InkScape, Affinity, Corel Draw, etc. Excellent for making: Bridal and Baby Shower Invitations, Invitation cards, Birthday cards, Thank You cards, and all kinds of cards, as well as banners, tags, cupcake toppers and jewelry. Software compatibility: .PNG files will work with most graphic software..EPS files will work with a variety of programs such as Adobe Photoshop or Illustrator, Sketch, InkScape, Affinity, Corel Draw, etc. Unember: Vector Supply Volume 28 contains 50 handsome old coins illustrations, sourced from genuine rare print published in New York, 1890. • 50 vector illustrations from NYC, 1890. Highly detailed and optimized graphics, grunged natural worn ink, perfect for high quality vintage print. • Vintage illustrations crafted from genuine catalog published in United States over 117 years ago – this pack includes illustrations of real coins used pre-1890 era. Software compatibility: Adobe Illustrator CC and newer. .PNG files will work with most graphic software. .EPS files will work with a variety of programs such as Adobe Photoshop or Illustrator, Sketch, InkScape, Affinity, Corel Draw, etc. 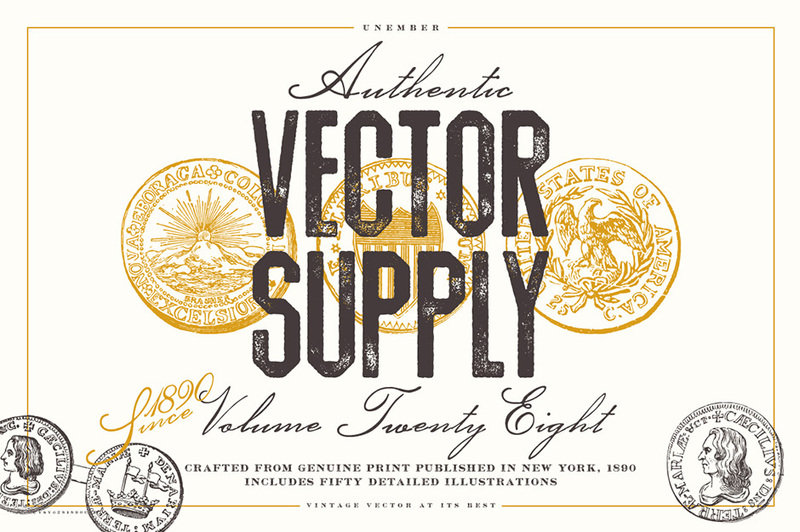 Unember: Vector Supply Volume 29 contains 50 much adored retro illustrations, sourced from weathered prints published in United States, 1890s. • 50 vector illustrations from 1890s. Highly detailed and optimized graphics, grunged natural worn ink, perfect for high quality vintage print. • Vintage illustrations sourced from prints published in United States over 110 years ago – the pack includes a great collection of United States stamps and printing outfits. • All graphics made are verified to be out of former copyright, in-house personally collected and owned, handpicked and reviewed in detail to make sure they are in the best shape for contemporary projects. Unember: Vector Supply Volume 35 contains 50 genuine vintage illustrations, sourced from scarce old prints published in United States, 1919. • 50 vector illustrations from United States, 1919. Highly detailed and optimized graphics, grunged natural worn ink, perfect for high quality vintage print. • Vintage illustrations crafted from genuine print published in United States of almost a century old – this pack includes an awesome collection of retro lifestyle items such as camera, pendants and the like. 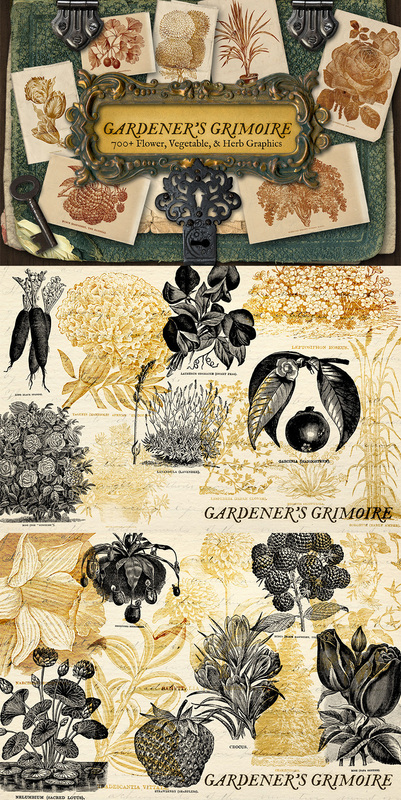 This collection of 700+ vintage flower, vegetable, herb, and various plant graphics were sourced from an antique book (owned in-house) published in 1910. They have been scanned and edited, but retain their vintage qualities and quirks from the original printing. Each graphic is provided in an individual .PNG file with a transparent background. They vary in size, but they are all quite large. Each is 300 PPI and an average of 8″x10″ with some larger and some smaller. These are wonderful images that can be used for many different types of projects including logo, t-shirt, and card design. These antique insect graphics were sourced from an antique educational entomology book, owned in house, and published in 1912. 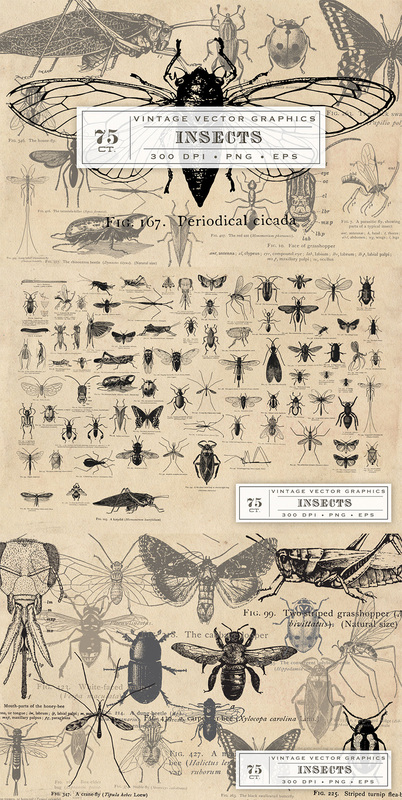 There are more than 75 vintage images of insects of almost every kind: ants, beetles, grasshoppers, locusts, flies, bees, cicadas, moths, butterfly, wasps, mosquitos, and more. Each of the vector (.EPS) graphics includes the notations that name the specific insect, so you know exactly what they are, and the individual .PNG files (transparent background, of course) are named appropriately as well for easy searching and reference. The .PNG files do not have the notations, however, only the insect graphics themselves. There are two .EPS files attached (CS2 & CS6), and each of the .PNG files are individual. They are 300 PPI, and are sized at about 5″ at the tallest or widest point. Maintain creative freedom while using vintage illustrations! • Carefully restored illustrations – Most of the sold vintage vector illustrations look just like in source materials – nicely weathered. But sometimes this can take away from your design. Some important parts of an illustration are faded or smudged. We have carefully restored all the illustrations. We removed paper textures, ink bleeds and repainted faded details. Now they look like first prints on quality paper. • Detailed vectorizations – Despite full restorations we worked hard not to make illustrations too clean and to keep their vintage look. • Widely usable – provided file formats (.AI, .EPS, .PNG ) can be used with Adobe Illustrator, Adobe Photoshop, Affinity Designer, Affinity Photo, Sketch etc. 300PPI transparent .PNG files are usable for projects both for print and digital. Software compatibility: Adobe Illustrator CS1 and newer. .EPS files will work with a variety of programs such as Adobe Photoshop or Illustrator, Sketch, InkScape, Affinity, Corel Draw, etc. .PNG files will work with most graphic software. A collection of 32 vintage astronomy illustrations from 18th Century books. All illustrations have been restored with great care and are presented in both very high-resolution raster and vector format. The big range of different formats included in the downloadable archive allows every designer to work with them as they are more used. But the images provided can also be used for a wide range of different designs, simple prints, or combined with custom backgrounds, arts, and photographs, to create custom graphics. The only limit is your imagination. Each illustration is presented in a single file, for a total of 32 files for each Graphic Format. • .JPGs – Total of 32 files saved on lossless compression with high resolution up to an astonishing 18MP for the more complex illustrations. • .PNGs Total of 32 transparent files with high resolution up to an astonishing 18MP for the more complex illustrations. • .AI and .EPS – Both illustrations are available on a multilayer, full vector file. .AI file is CC compatible while .EPS is Illustrator .EPS 10 compatible. Software compatibility: Adobe Illustrator CC and newer. .EPS files will work with a variety of programs such as Adobe Photoshop or Illustrator, Sketch, InkScape, Affinity, Corel Draw, etc. .JPG and .PNG files will work with most graphic software. A collection of 50 black line sugar skulls. Different styles from human to animal skulls, mexican style, cute, horror, and many others. Software compatibility: Adobe Illustrator CS3 and newer. .EPS and .PDF files will work with a variety of programs such as Adobe Photoshop or Illustrator, Sketch, InkScape, Affinity, Corel Draw, etc. .PNG files will work with most graphic software. Black and White and Color Tiki head illustrations for your quirky design needs. • Vector .AI, .EPS 10, .PDF – you can scale them to any size, change colors etc. (each design is saved as separate file). Set of 35 city skyline. File includes vector .EPS 10 file, .AI, 35 .PNG ( approx. 6800x3000px 300 PPI) and .JPG picture. Software compatibility: Adobe Illustrator CS3 and newer. .EPS files will work with a variety of programs such as Adobe Photoshop or Illustrator, Sketch, InkScape, Affinity, Corel Draw, etc. .JPG files will work with most graphic software. 46 Guilloche Rosettes. These elements will fit for all your personal or commercial projects; logo design, cards, brochures, prints, decorations or signs and apparel designs. Included in download files are Adobe Illustrator CS3+, .EPS 8 file format and .PDF (vector files can be edited, recolor, enlarged and printed at any size). For raster files; 300PPI .PNG in 2 colors of each items: Black and White at approximately 10″ at the longest side. What’s in the download: 3 Vector files (.PDF, .EPS 8 & .AI CS3) 92 .PNG (46 in black & 46 in white) files with transparency. Software compatibility: Adobe Illustrator CS2 and newer. .EPS files will work with a variety of programs such as Adobe Photoshop or Illustrator, Sketch, InkScape, Affinity, Corel Draw, etc. .PNG files will work with most graphic software. 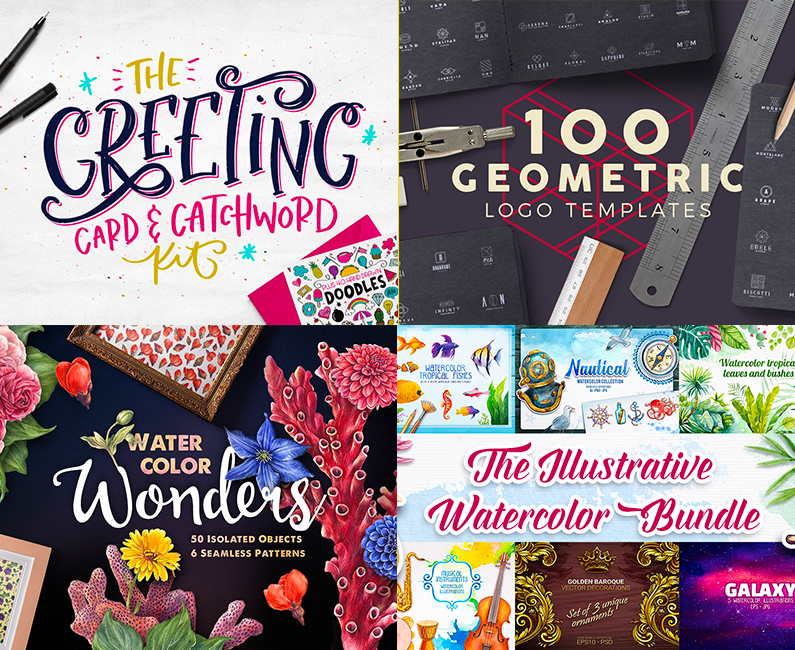 This bundle offers huge variety of quality, unique vector elements, including hand-illustrated graphics, technical, vintage illustrations, decorative flourishes & florals, modern illustrations, textures, logo packs, geometric shapes and much more. File size is approx 6.3GB (33.43GB unzipped), split into 25 parts - one link per designer or an optional one click download. A .PDF guide has also been provided for easy browsing. Noo, I’ve just returned home to my inbox after a holiday and saw this bundle! Is there anyway I can still purchase it?? Would you be kind enough to email me too please? I absolutely thought i had purchased this but now i come to check my downloads i didn’t! I am so sorry to be the bearer of bad news, but this bundle expired over a year ago now in March 2017! We don’t re-run our bundles but we will definitely have similar styled bundles in the future! Sadly I had this deal in my cart just waiting until today to purchase it, and I missed it. Any chance you’d let me still purchase it (pretty please :))? It’s great to hear that you were able to pick this one up just in the nick of time! 🙂 We hope you enjoy working with your new resources! What are the download file sizes as I have not yet been able to download any of the backgrounds yet? Hello! can i use your freebies for commercial use? As always! Amazing Deal! Just grabbed this! Very Excited to start using it! I’ve written via the contact link below and also via email, but have not gotten any responses. The first message was through email about a week or so ago. The last message was through the contact us link below and it was more than 24 hrs. ago. Would you be so kind and check for my messages and let me know if you don’t have them? At this point I’m not sure how else to try to contact you except through this comments area. Thank you so much for your comment and I am so sorry that you haven’t been receiving our emails! I did pick up your two emails, so I would definitely suggest checking your spam in case I have ended up in there. I am also going to try reaching your from another email address to see if this one reaches you. We really hope that you’ll love working with all your new resources Noelle and that you get loads of use out of them! 33GB? Mine is only showing 6.3 GB for all the files. Am I missing something? Thank you so much for your comment and I am so sorry for any confusion caused by this! I’ve purchased the Christmas special bundle and one of the items in it is the gemstone cutting patterns, so I already have that in my ever expanding toolkit. Other than that little disappointment that’s not really a big deal I’m definitely buying this! If you can’t spend your weekends playing with your DC purchases, then what can you do? All jokes aside Mardy, we cannot thank enough for your kind words and support- it really does mean the world to us all. It’s good. It could be so much better though. The Inspiring Artistic Collection has a PDF guide showing everything that has been purchased. Thank you so much for your comment and I am so sorry that you are having trouble locating your PDF guides! Simply amazing. That’s exactly what i needed ! Thank you Design Cuts, As always you rock ! Oh, wait… We don’t have a skyline. Aww thanks so much as always, for your kind words! A break for the wallet this time round. It’s Just the pencils is what I would like, they look quite good. Exactly what I would like to purchase. A giant brush deal! Thanks so much for letting us know that you’d love to see this too! Do you know what time it is? It’s the VECTOR DANCE time!! WoooooHoooo!! Another Excellent work indeed by Team DC. Keep it comin’ and I’ll keep on dancin’. Thanks again guys. And of course… a FULL 5-Star for this bundle. Thank you so, so much for another awesome comment! I can see it now, the whole world dancing in unison to the vector routine 😀 we were super excited to share this with you and I am so glad that it didn’t disappoint. Brushes!!! Jeremy Child has every right to call those pencil brushes perfect, they are superb. The RSCO brushes are a nice little bumper pack with some sweet textures too. No matter how long I roam the earth I will never have enough brushes, thanks guys! Ah thanks so much for leaving such a lovely comment! Thanks so much Amy! It’s so good to hear such positive feedback! We are once again presented with an irresistible collection produced by talented and generous designers. This may be the best set of assets yet, but then again I said that the last time, and the time before that, and… Well done and thank you. Thank you for another fantastic comment. This bundle is amazing, as always. I have no idea how I can use even half of these things but I want to use them all. I just need you to stop conspiring to take my money. But please don’t. Take my money. Take it all. It’s not intentional, I promise 😀 but we truly appreciate you taking the time to let us know how much you love this bundle and we really hope that you’ll get loads of use out of it. Thank you so much for your comment and I am really sorry to hear this! I have just popped you over an email to get some more information from you on this as we would have for you to be disappointed in any way. We want our community to love their purchases so our sincerest apologies if this isn’t the case for you. Holy Moses! I was not going to spend ANY money this month. None!! –I’m IN!!!!!!!! Aww thank you so much for your awesome comment! Now I have this vision of you running down the stairs in your pyjamas to open your laptop and see what deals Santa has bought you this week ha-ha. We are forever in debt to your children with all the purchases you have made 😀 and as always, your support is truly appreciated by us all. No Toronto skyline, with the largest (or second largest now I think) free-standing structure in the world, the CN tower? Aie! It’s CLASSIC! Thanks for the comment and sorry to disappoint you on Philadelphia! We will definitely ask Maxim Gertsen if there is a chance of a future update as I would love for my own home city of Dublin to be featured :). If Kuala Lumpur skyline was possible, maybe a Singapore skyline is doable too? With Marina Bay Sands Hotel, Singapore Flyer, and the Merlion. Pretty please? 🙂 I will wait patiently, I promise.